Harmony Korine, Alexey Fedorchenko and Jan Kwiecinski each take a directorial segment in this trio of short (around 30mins each) films based around the concept of the fourth dimension. Each has its own distinctive style and tone but in so doing reveals the problem of buffet filmmaking: if you only like one of the dishes, Iâ€™m sorry but youâ€™re actually stuck with the other two as well. Each director was given a set of rules to abide by in making their short â€“ including using a song made up especially for the movie, having a character called Mickey House, and shooting one scene blindfold â€“ but how they put those into practise was down to them. Itâ€™s a list reminiscent of the Dogme school of filmmaking â€“ itself a signal that you might expect mixed results. Korineâ€™s segment, The Lotus Community Workshop, is first out of the blocks, and is certainly the one that will grab most of the headlines. In it Val Kilmer plays a motivational speaker called Val Kilmer. Heâ€™s a crazy, charismatic guy keen on the concept of empowerment, cotton candy, and not wearing velvet: because Elvis died in velvet. Itâ€™s funny, witty and for the most part shot in a cinema vÃ©ritÃ©-style. However, intercut with Valâ€™s speech at a local center, is an ethereal, hazy section as Val kicks back and relaxes by playing video games, riding his bicycle and chilling by the pool. Dude! Kilmer sends himself in a performance thatâ€™s far removed from the brooding, sucked-in cheekbones, roles heâ€™s famous/infamous for and itâ€™s a charming way to spend 30 minutes. Fedorchenkoâ€™s Chrono Eye, is tonally and visually more downbeat but it has a sweet heart buried in there. In it, an irascible professor (Igor Sergeev) discovers that he can time travel, but the caveat is that he can only see through the eyes of a random stranger for a handful of seconds during the pivotal moments in history that he chooses to visit. Fedorchenkoâ€™s intention is clear, however, because what the professor seeks by looking back in time is, in reality, right under his nose. While not as visually arresting or even initially as inviting as Korineâ€™s effort, Chrono Eye does give the audience pause for thought. The camerawork is more static and the editing less flashy, but you get drawn in because the professorâ€™s search is so personal, and the denouement is one that, as an audience, you often chase after. Fawns, the final part of the trilogy, and directed by Polandâ€™s Kwiecinski, changes tone yet again. There is an eerie calm and stillness about the vivid images of a group of young people running wild around town. The difference here is that the town in question has been evacuated because a flood is coming. According to Kwiecinski, his approach to visualising the fourth dimension was to tell â€œa story about the lost people from my generation who, from all the falsity surrounding us constantly, decide to risk their lives to experience something truly free and realâ€. It is a concept that nags away as you watch the teenagers amuse themselves in their deserted playground. They appear to be caught in the gap between self-preservation and the freedom to roam unchecked and unfettered. Kwiecinski even finds time for a reference back to Kilmer and the Lotus Community Workshop, which semi-neatly bookends the trilogy. Each short has a rhythm and identity of its own, and there is much to appreciate in each. However, the loose theme does have a reductive effect on the â€˜movieâ€™ as a whole. Conceptual ideas are great for filmmakers to discuss, and the short-film medium is one where the craft of moviemaking is experimented with â€“ for improved results somewhere down the line â€“ but putting the offerings together can end up making the whole a strange brew. 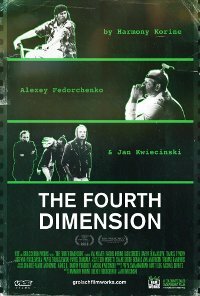 That said, The Fourth Dimension is never anything less than watchable, and when it connects and gets things right it manages to deal with important concerns and emotions.